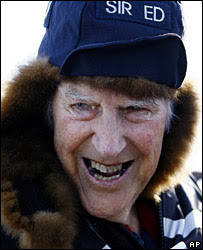 Sir Edmund Hillary, the first man to reach the peak of Mount Everest, died of a heart attack at 88. Check out that face. Don't you love him instantly? New Zealand's prime minister described him as a "colossus". "The legendary mountaineer, adventurer, and philanthropist is the best-known New Zealander ever to have lived," Ms Clark said in a statement. "But most of all he was a quintessential Kiwi. "He was ours - from his craggy appearance to laconic style, to his directness and honesty. All New Zealanders will deeply mourn his passing." The article goes on to state that Ang Rita Sherpa, a sixty-year-old man from a community in Nepal who adored Hillary, prayed for Hillary's reincarnation. I can't imagine what he'll come back as, but I'm terribly excited to find out. I hope he is reborn with equally intense eyebrows.